The California State Water Resources Control Board initiated a regional monitoring program in July 2015 to determine where and to what degree groundwater quality may be adversely impacted by oil and gas development activities. 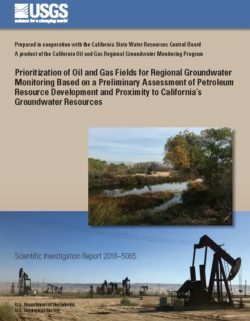 A key issue in the implementation of the regional groundwater monitoring program is that each year, detailed characterization work can be done in only a few of California’s 487 onshore oil and gas fields. The first step in monitoring groundwater near petroleum development is to prioritize oil and gas fields using consistent statewide analysis of available data that indicate potential risk of groundwater to oil and gas development. 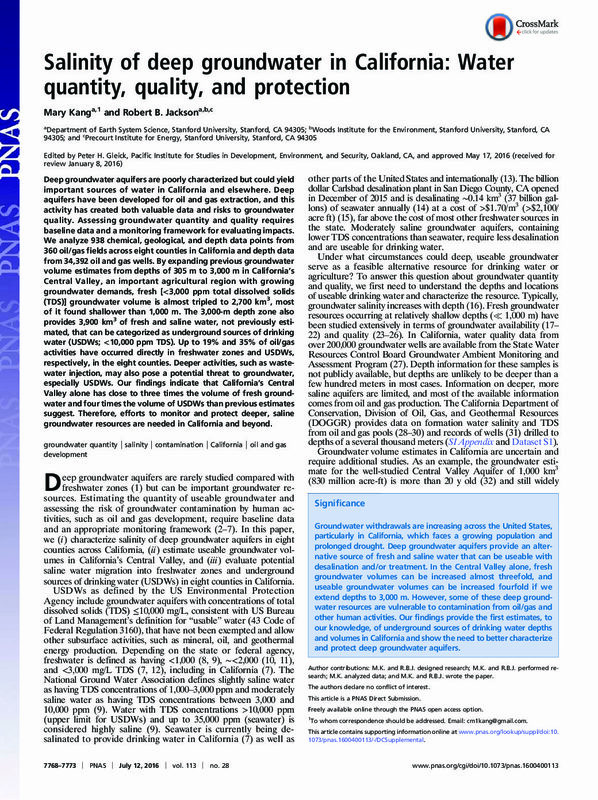 The U.S. Geological Survey compiled data for four factors that characterize the intensity of petroleum resource development and proximity to groundwater resources: petroleum-well density, volume of water injected in oil fields, vertical proximity of groundwater resources to oil and gas resource development, and water-well density. An overall priority ranking for each field was determined by computing summary metrics, analyzing statewide distributions of summary metrics for all oil and gas fields, using those distributions to define relative categories of potential risk for each factor, and combining relative risk rankings for different factors into an overall priority ranking. This preliminary assessment does not represent an evaluation of groundwater risk to oil and gas development, which needs to be based on detailed analysis and data related to development activities including well stimulation, well integrity issues, produced water ponds, and underground injection. Based on the prioritization analysis, 22 percent (107 fields) of the total number of oil and gas fields in California were ranked as high priority, 23 percent (114 fields) as moderate priority, and 55 percent (266 fields) as low priority. These results indicate that between 100 and 200 oil fields are principal candidates for the next steps in the regional monitoring program. The land area of fields that ranked high priority accounted for 41 percent of the total field area (3,392 square miles). More than half of the high priority fields were in the southern San Joaquin Valley and the Los Angeles Basin. Some of the larger fields tended to have higher rankings because of greater intensity of petroleum development, sometimes coupled with proximity to groundwater resources. Deep groundwater aquifers are poorly characterized but could yield important sources of water in California and elsewhere. Deep aquifers have been developed for oil and gas extraction, and this activity has created both valuable data and risks to groundwater quality. Assessing groundwater quantity and quality requires baseline data and a monitoring framework for evaluating impacts. We analyze 938 chemical, geological, and depth data points from 360 oil/gas fields across eight counties in California and depth data from 34,392 oil and gas wells. By expanding previous groundwater volume estimates from depths of 305 m to 3,000 m in California’s Central Valley, an important agricultural region with growing groundwater demands, fresh [<3,000 ppm total dissolved solids (TDS)] groundwater volume is almost tripled to 2,700 km3, most of it found shallower than 1,000 m. The 3,000-m depth zone also provides 3,900 km3 of fresh and saline water, not previously estimated, that can be categorized as underground sources of drinking water (USDWs; <10,000 ppm TDS). Up to 19% and 35% of oil/gas activities have occurred directly in freshwater zones and USDWs, respectively, in the eight counties. Deeper activities, such as wastewater injection, may also pose a potential threat to groundwater, especially USDWs. Our findings indicate that California’s Central Valley alone has close to three times the volume of fresh groundwater and four times the volume of USDWs than previous estimates suggest. Therefore, efforts to monitor and protect deeper, saline groundwater resources are needed in California and beyond.